Travelling at speeds of 40 mph across the water on bare feet is a major adrenalin rush but it needs to be done responsibly otherwise skiers will be nursing more than painful soles at the end of the day. 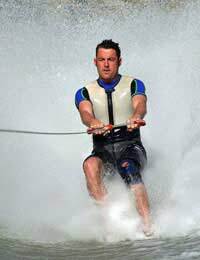 Barefoot skiing is essentially water skiing behind a motorboat but without the use of water skis. ‘Barefooting’ means skiers need to travel at higher speeds than conventional water skiers. The watersport is believed to have originated in the USA in the late 1940s before competitions began being held the following decade. In competitive barefoot skiing there are three main disciplines; tricks slalom and jump. In the trick event the barefooter has two passes of 15 seconds to complete as many different elaborate tricks as possible. The slalom event involves the skier attempting to cross the wake as many times as possible within the two 15 second passes. In the jump event the skier leaps using a small, fibreglass ramp. They are allowed three attempts and the longest jump is marked down as their entry. Although many watersports are using increasingly advanced technology to achieve their thrills, there is at the same time a field moving in the opposite direction, and stripping down traditional watersports to a primitive core. Such primitive disciplines as bodysurfing and barefoot skiing are becoming increasingly popular not only because they’re cheaper but because they take participants closer to the natural elements. Barefoot wetsuit – This special type of wetsuit is padded and has built-in buoyancy so that a lifejacket is unnecessary. This design is aimed at those who want to perform tricks without any restrictions, and a traditional buoyancy aid can still be worn. Padded Shorts – Most barefooters wear padded neoprene shorts to protect their rear, a item particularly valued when performing the deep water start and tumble turns. Powerful Boat – As barefooters need greater speeds to perform their tricks than conventional water skiers, the boat needs to be able to travel at an appropriate speed. There are boats specifically designed for barefooting with small wakes and high speeds. Tow Line – The maximum tow line length in water skiing is 75 metres, but in barefoot skiing it can go up to 100 metres. With the longer rope barefoot skiing requires a greater buffer zone between the action and the other water users. Shoe Skies - The feet of novice barefooters can acclimatise to the fast waters with the aid of shoe skis, which are only a few inches longer and wider than the skier’s foot. The boat must employ a ‘spotter’. This designated look out is there to keep the driver informed as to the position of the skier at all times, whilst at the same time keeping their eyes peeled for obstacles, docks and other boats. Apart from when taking off from shore and landing, the towing motorboat must stay at least 100 metres away from the shoreline, piers, bridges, people in the water and other water craft. For safe barefoot skiing it should be viewed as a team sport, with the skier, boat driver and spotter being the team players all working harmoniously together. The skier should be able to inform the rest of the team what they want to do, and be able to communicate with hand signals. The boat driver should not dictate the actions of the venture.